He is a born frequent flier — a baby boy, born on Sunday 35,000 feet above sea level on a Jet Airways plane from Saudi Arabia to India, has received a free lifetime pass from the airline as his first birthday gift. Jet Airways on Tuesday (20JUN17) further enlarged European codeshare network, which sees Jet Airways’ 9W-coded flight numbers being placed on KLM operating flights. Planned new codeshare routes as follow. So all one needs to get a lifetime of free plane tickets is to have a foolish mother who chooses to travel long haul by air when she is near full time pregnant. By the way, Pan Am had this crap as well. If you were born on a Pan Am flight, you got free tickets for life and that's not all. As all Pan Am aircraft irrespective of where they were in the world were considered US territory, you also got a US citizenship by birth. This was a pre-mature delivery.So cant really blame the mother. The baby survived, so it must have been more than 28 weeks. That's the seventh month and it is quite unsafe for a expecting mother to travel after that. Quite irresponsible on the part of the mother. Even at 28 weeks it would have been touch and go for the poor baby. If her gynaec is ok with it, she has every right to travel. Jet Airways at the launch of winter 2017/18 season is adjusting operations for Delhi – Singapore route, currently served once a day. From 29OCT17, the airline will introduce 2nd daily rotation, however operational aircraft will switch from 777-300ER to 737-800 aircraft. Posted: Sat Jul 15, 2017 1:38 am Post subject: Prep for SkyTeam entry ?? Prep for SkyTeam entry ?? Jet Airways will cease its Frequent Flyer Partnership arrangements with American Airlines, Austrian Airlines, Lufthansa Airlines, Swiss International Airlines and Turkish Airlines. Jet Privilege members will not be eligible to accrue miles on or after partnership discontinuation date mentioned below. Claims for travel on these Airlines prior to the discontinuation date will however be accepted for retro-credit up until six months from the discontinuation date; original boarding pass and copy of e-ticket will be required to process these claims. Award tickets that have already been issued prior to discontinuation date, will continue to remain valid for travel as per the booked dates, however no voluntary date or itinerary changes can be made to these tickets. •	Lufthansa Airlines: 31st December 2017"
Posted: Mon Jul 17, 2017 11:47 am Post subject: Re: Prep for SkyTeam entry ?? Is this ab indication of 9W moving towards Skyteam?! Posted: Mon Jul 17, 2017 7:05 pm Post subject: Re: Prep for SkyTeam entry ?? Could be or at a min DL/AF/KL's pound of flesh for giving 9W cheap connecting seats between the EU and the US. That said it makes sense. 9W needs a partner invested in its growth / making it better. Partnering with everyone just makes you .... with no one really looking out for you. I know a formal JV requires open skies and what not (but who knows about the exact rules the US / Indian govt will place), but I would imagine a real JV with antitrust immunity and which is metal neutral will happen before Skyteam (very much like VS). I guess DL/AF/KL informed 9W that you can't whore around with everyone for the rest of your life. Jet Airways has decided to sublease out its fleet of ATR planes to regional carrier TrueJet. The deal, which is taking a final shape, could be announced in two months, said people aware of the development. Jet has 15 ATR 72-500s and three ATR 72-600s which are leased from foreign lessors. The deal may see Jet Airways leasing out the planes in a phased manner, starting with six planes in the first phase. The move is likely to help the company earn money at a time when it is looking for funds for its fleet induction and expansion plans. 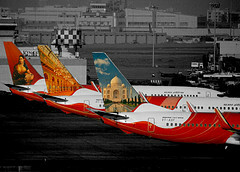 A TrueJet executive confirmed that the airline is in discussion to lease the planes from Jet Airways. “The talks are for dry leases of planes in a phased manner,” he said. It had been reported earlier that Jet Airways was planning to phase out its ATR fleet. Officials say that the airline felt, given a larger focus on international routes, ATRs did not fit in the present scheme of things. Add to that, a scarcity of pilots to fly smaller planes and high maintenance costs. At present, expat pilots operate most ATRs for the airline, which leads to higher costs. For an airline, the cost of an expat pilot is at least four times that of an Indian pilot. “ATRs no more suit our strategy. Their maintenance costs are higher, getting pilots for them is difficult, and for the management, it was becoming too difficult as the network strategy of operating an ATR is very different from that of a Boeing 737 or Airbus A330,” a person aware of the development said. China Eastern and Jet Airways starting next week will commence reciprocal codeshare partnership, covering service between China and India, as well as selected domestic service. From 24JUL17, planned codeshare routes as follow. Within 24 hours of KLM-Air France, Virgin Atlantic and Delta announcing a blockbuster deal globally, ET NOW exclusively learns the Indian skies may also soon be a part of this grand global alliance. Sources tell ET NOW that Jet Airways is in advanced talks with KLM-Air France for a strategic cooperation that could function as a virtual merger of the two airlines. The talks are said to be at an advanced stage between Jet Airways and KLM. It is commercial pact which is called metal neutrality in the aviation space. Metal neutrality or virtual merger basically means a total indifference to whose plane is ferrying the passengers, but revenue will accrue to both sides. In this the airlines share flights, flight scheduled, parking lots for airplanes. Sources say the strategic pact may virtually be a merger. This is the way consolidation has taken place in the US. If there is a similar agreement being signed, it would be a first for an Indian carrier. On July 27, a mega deal was announced in the aviation space with Delta buying 10 per cent stake in KLM and KLM buying 31 per cent in Virgin Atlantic. According to sources, Jet is going to be a part of this blockbuster deal. Sources say talks are stuck on valuations between the principles in Delta and Jet and one can see the strategic co-operation in the deal—the virtual merger between KLM and Jet -- close prior to that. Earlier, there were reports indicating that Jet is looking to expand its commercial ties and that other airlines have evinced interest. Jet has a nice 17-18% domestic market share plus people are interested in the international routes, because after Air India, it is clearly the best airline in that segment. Earliest example of metal neutrality in recent memory would be KLM-NorthWest before NW was gobbled up by Delta. Here, Delta already holds a stake in Virgin Atlantic. Wondering if ET too will join considering it holds a stake in 9W. It will provide seamless connection to AMS both ways. They might probably restart DEL-CMB with the same a/c. I think they will obviously find somewhere to fly it in the down time. But this is actually great for them. My understanding is that BLR has trouble filling Y but is good in J class. CMB can provide the Y needed plus this should be one of the best sky team connections to CMB from both CDG (the AF flight) and AMS (the 9W flight). Are they hoping to get so much of feed for the AMS flight from CMB that they can offset the loss of making an aircraft sit on the ground for 20 hours? The proposed BLR flight also sits neatly between the two existing BOM flights. Is'nt there a possibility of a plane doing BOM-CMB-BLR-CMB-BOM + a second, re-timed BOM-BLR-BOM? Jet Airways recently narrowed down its list of meal preferences on offer for domestic passengers from 23 to a meagre seven. That makes it the only full-service airline in India to leave slim pickings for passengers who suffer from food allergies. Jet Airways this week plans to operate one-time charter service to Mauritius, on board Airbus A330-300 aircraft. Operational schedule is filed in the GDS and OAG Schedules Analyser, displaying nonstop Hyderabad – Mauritius flight, departing India on 09AUG17, Mauritius on 12AUG17. Jet Airways at the launch of winter 2017/18 schedule continues to expand Middle East flight, including new offering of Delhi – Riyadh flight. From 29OCT17 (DEL departure), the airline’s Boeing 737-800 aircraft will operate this route on daily basis. It was the first airline to offer a first class suite in the sky. But a decade later, poor demand has prompted Jet Airways to plan a reconfiguration of its Boeing 777-300ER aircraft. Jet Airways may remove the eight first-class seats and instead add economy and business class seats in its wide-body Boeing planes. The objective seems to be to improve revenue and reduce unit costs. Unit costs refer to cost incurred in transporting a passenger per kilometre. Jet Airways has 10 Boeing 777 planes, which it inducted during 2007-08, and it flies them to Amsterdam, Hong Kong and London. The aircraft has 346 seats in a three-class configuration (eight first class, 30 business class and 308 economy class). Plans for reconfiguration are being evaluated as the airline is due to pay off aircraft loan next year. The move is expected to bring down the ownership costs. “The idea is to make the aircraft more dense but there is no decision yet on how many seats to add and whether those should be in economy or business,” said an airline source familiar with the matter. “As a policy, Jet Airways does not comment on speculation or on matters internal to its business,” an airline spokesperson said. Time they tried Premium Economy too.. Agreed. They should (1) take out first, (2) add premium economy and (3) add a few rows of extra legroom economy comfort. If they keep first it should just be 4 seats like AI. 4F + J + PY + Y-Comfort + Y ? How is Jet doing on BOM/DEL-HKG/SIN? When I flew to HKG in June, I noticed that hardly anyone had boarded the 9W flight to HKG while my CX flight was totally full. I guess most of them might be transit passengers flying onward to other destinations, but I wonder if 9W are able to cope with CX on the HKG route and SQ's double daily to SIN? It might get tougher for them when CX replace their A333 with the 77W. Yes. The only reason I can think they should keep 4 F seats is really for upgrades. Meaning take J class corp account travelers who have status with hem and upgrade them to F. AA does this. It really keeps people loyal. Even say it must be in the higher J class fares (meaning discount J not available for free upgrade). 9W needs to counter the ME3. I think the FF program is a great way to do it (and then change when you get stronger - like the US3 did). That said, probably 2 frames should get rid of F and be shifted to a low J seat count with 2 rows of Y+ and 3 rows of extra leg room. They can fly these to the gulf (assuming they don't have need for 2 frames going to EU/US). Maybe it's just time for a new J Class hard product standardized across the wide-bodied fleet with this product as the flagship product. Other than BOM-LHR, few routes can sustain First anymore. Jet Airways at the launch of winter 2017/18 season is increasing Mumbai – Riyadh flight, as the airline schedules 2nd daily operation, effective from 29OCT17. Boeing 737-900ER will operate this route. Continuing its focus to expand connectivity between emerging cities in India, Jet Airways is set to introduce as many as 56 new weekly flights in this month and the next, ahead of the festive season. The new flights – that include industry firsts as well as a mix of non-stop and one-stop services between key Indian cities, are in response to the rising demand for aviation services in these cities and will further strengthen the airline’s footprint across its domestic network that currently comprises 44 cities. Jet Airways today offers over 100,000 seats per day to its guests. In a series of industry-firsts, Jet Airways will introduce daily flights from Pune, connecting the ‘Oxford of the East’ to Guwahati via Kolkata as well as to Coimbatore. In other notable firsts, Jet Airways is also set to commence flight operations between Bengaluru and Silchar, as well as New Delhi and Jorhat. Jet Airways will be the only airline in the country flying these routes which will not only bolster connectivity from Pune but will also improve connectivity of North East India with the rest of the country. Jet Airways has added a pre-owned 737-800 to the fleet today, as VT-JTH. Jet Airways Ltd. is finalising talks with Air France-KLM to create a joint venture between Europe and India, Bloomberg reported citing French weekly La Tribune. The JV will be connected with the partnership between Air France-KLM, Virgin Atlantic and Delta without being part of it, said the report. India's second biggest airline by market share, Jet Airways is not a member of any aviation alliance but has code share agreements with other airlines, including Air France and KLM. The deal follows the deepening of commercial ties between Jet and Air France-KLM since the code-sharing pact in 2014. Jet Airways will start flying a Paris-to-Chennai flight from October as part of the code-sharing pact with Air France. It also shares a pact with KLM where it will start a daily Amsterdam-to-Bengaluru flight. Shares of Jet Airways closed 0.75 percent higher ahead of the report, while the benchmark BSE Sensex ended trade flat on Friday. One report said Jet would not be a part of the DL/KL/AF transatlantic JV just a India-EU JV. How will this work when the bulk of the traffic goes between India and USA instead of to/from Europe? Also I really wish 9W would get closer to DL, they are a well run airline. AF/KL probably won't improve 9W. All AF cares about is pushing more people through CDG. From October 29, 2017, Jet Airways 9W 510 will depart from Delhi at 23:00 hrs and arrive into Riyadh at 01:35 hrs (local time). The return flight, Jet Airways 9W 509 will depart from Riyadh at 03:10 hrs (LT) and arrive into Delhi at 09:45 hrs (LT). Operating five days a week on the Chennai-Paris sector, 9W 128 will depart Chennai on October 29, 2017 at 01:45 hrs (LT) and arrive in Paris at 08:10 hrs. Jet Airways’ 9W 127 will depart from Paris at 10:10 hrs (LT), and arrive in Chennai at 00:15hrs (LT). On the Bengaluru-Amsterdam route, Jet Airways 9W 236 will depart Bengaluru at 02:25 hrs. (LT) and arrive in Amsterdam at 08:35 hrs (LT). On the return leg, the daily service, 9W 235 will depart from Amsterdam at 10:50hrs (LT) to arrive at Bengaluru at 00:40 hrs (LT). Effective October 29, 2017, and as part of the airline’s forthcoming winter schedule, the new daytime service between Mumbai and London, 9W 116 will depart from Mumbai at 0905 hrs to arrive in London Heathrow at 1335 hrs (local time). On its return, 9W 115 will leave London Heathrow at 1530 hrs (local time) and land in Mumbai at 0555 hrs. Also commencing on October 29, 2017, Jet Airways service between Mumbai and Riyadh, 9W 520, will depart Mumbai at 03:00 hrs (LT) and arrive in Riyadh at 05:05 hrs (LT). On its return leg, Jet Airways 9W 519 will depart from Riyadh at 06:10 hrs (LT) and arrive into Mumbai at 12:30 hrs (LT). Commencing its second daily frequency between New Delhi and Doha, Jet Airways 9W 202 will depart from New Delhi at 2350 hrs (LT) and arrive into Doha at 0145 hrs (LT). Returning from Doha, Jet Airways 9W 201 will depart for New Delhi at 0245 hrs (LT) and arrive at its destination at 0840 hrs (LT). The New Delhi-Dammam service, Jet Airways 9W 518, will depart from New Delhi at 2200 hrs (LT) and arrive into Dammam at 0015 hrs (LT). Returning from Dammam, Jet Airways 9W 517 will depart at 0115 hrs (LT) and arrive into New Delhi at 0730 hrs. This will be airline’s second frequency on the New Delhi – Dammam sector. From October 29, 2017, Jet Airways will operate its second daily frequency between New Delhi and Singapore. Jet Airways 9W 20 will depart from Delhi at 0105 hrs (LT) and arrive into Singapore at 0925 hrs (LT). On its return leg, Jet Airways 9W 19 will depart from Singapore at 1115 hrs (LT) and arrive into Delhi at 1450 hrs (LT).